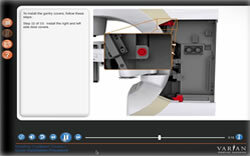 These interactive modules contain photo-realistic 3D models of complex devices, and introduce learners to device design, installation procedures, and service tasks. Topics this detailed are often covered in paper-based product manuals, which can be confusing and insufficient. Each step is thoroughly explained and demonstrated using 3D demonstrations, zooms and highlights, on-screen instructions and audio narration.